CEDAR KNOLLS, NJ, November 22, 2011- Eggland’s Best (EB), the number one branded egg in the United States, has received the ‘Recommended Egg’ and official ‘Certified Vegetarian Product’ honors from the American Vegetarian Association (AVA); becoming the association’s first-ever egg brand to receive both of these recognitions. The AVA certification program enables vegetarian-minded people to make accurate food choices. 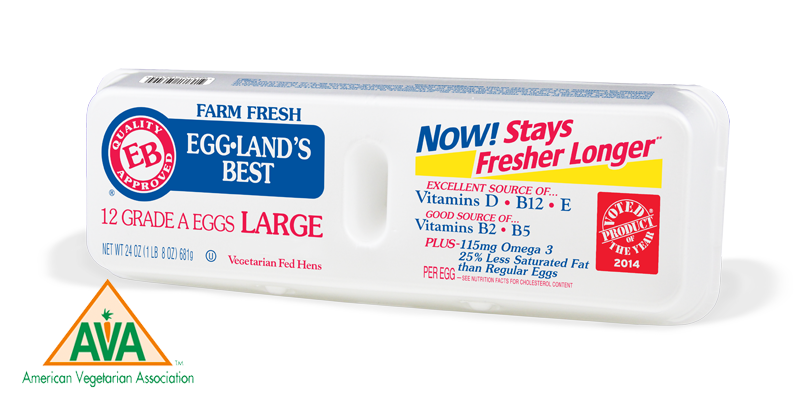 Eggland’s Best qualifies for the AVA honors because they feed their hens a wholesome, vegetarian diet, which is free of animal fat and other byproducts, and only contains healthy grains, canola oil, rice bran, alfalfa meal, kelp and Vitamin E. As a result, all Eggland’s Best eggs are superior in quality and nutrition. Eggland’s Best eggs are produced locally throughout the country by EB’s franchised framers, who must follow the company’s strict quality assurance program in order to stamp an egg with the “EB” logo. A great option for vegetarian-minded people, Eggland’s Best produces classic, organic and cage free eggs that are 25% less in saturated fat and provide two times more Vitamin D and omega-3, as well as 10 times more vitamin E, compared to ordinary eggs. For more information on Eggland’s Best eggs and the AVA certification program, please visit www.EgglandsBest.com. Eggland’s Best is the No. 1 branded egg in the U.S. and is an excellent source of Vitamin D, E, and B12 and a good source of riboflavin. EB eggs have 25 percent less saturated fat and more than two times the Omega-3 than ordinary eggs. Eggland’s Best eggs are the recipients of many awards including the Gold Medal for superior taste, appearance and freshness from The American Masters of Taste; The American Culinary Federation’s Gold Seal of Approval; the ‘Certified’ and ‘Recommended’ egg by the American Vegetarian Association; the Good Housekeeping Seal from Good Housekeeping Research Institute; Best Grab-and-Go Breakfast Food by Health magazine (2011);one of the Top 125 Foods for Men in the Men’s Health annual nutrition awards for seven consecutive years (2005-2011); “Best Egg” by Men’s Health magazine on their list of Top 20 Organic Foods (2010); one of the top 125 Best Packaged Foods For Women according to Women’s Health magazine two years in a row (2010-2011); one of the 25 Healthiest Foods for Women by Prevention magazine (2010);a top five “superfood” picks according to American Baby magazine (2010); and the National Health & Wellness Club Stamp of Approval for flavor, quality and nutrition. The distinctive “EB” stamp on the shell assures consumers that the eggs meet the highest standards of taste, nutrition and quality. Eggland’s Best hens are fed a strictly controlled, high-quality, wholesome, all-vegetarian diet without added hormones, antibiotics or steroids of any kind. EB eggs are available in large, cage free and organic varieties, and are certified as Kosher. For more information, visit . The AVA was created to promote the interests and concerns of individuals and organizations involved in the preservation, propagation, and distribution of vegetarian ideas and products. The primary goal of the AVA is to provide a widely recognized certification program which will enable vegetarian-minded people to make accurate food choices, being certain they can be confident in their selection, and that of the manufacturer’s claims. For more information, visit www.amerveg.com.